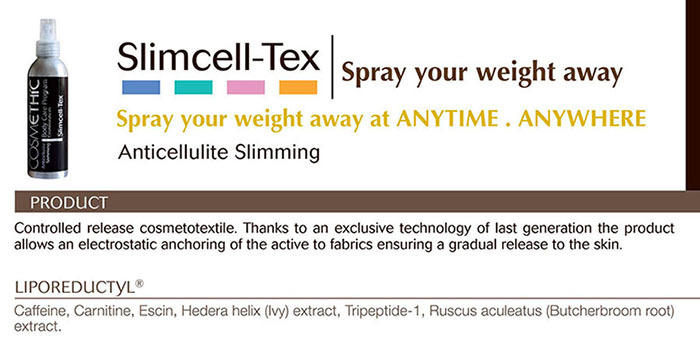 SlimCell-Tex is a Cosmetotextile product containing the best Anticellulite-Slimming Active Functional Ingredients: Liporeductyl® - Caffeine, Phosphatidylcholine, Carnitine, Tripeptide-1, Escin, Ivy extract, Butcher's Broom extract. What is and how a Cosmetotextile works? A Cosmetotextile is a technology of last generation that through a process of microencapsulation of the active ingredients it allows in a first stage the electrostatic anchoring to textile fibers and in a second time a gradual and constant release on the skin. The release from the microcapsules is activated by contact and friction between fabric and skin that releases the active ingredients locally. Could, the micro-encapsulation system of SlimCell-Tex, be aggressive to the skin? Absolutely not! SlimCell-Tex uses maltodextrins as a system of micro-encapsulation. Maltodextrins are natural sugars of plant origin. Maltodextrins absolve the function to protect and carry the active ingredients and, at the same time, they exert a significant moisturizing effect on skin. Yes .. it seems so far-fetched and fantastic to think we can potentially transform our entire wardrobe in active cosmetics which we could not even believe that, and yet ... it is just so ...! Let's answer with a question that will help us to better understand what we're talking about: why do we apply cosmetics on our skin? On reality to bring active ingredients to it (the real actors of the activity of cosmetic products) ..! Therefore creams and serums simply are vehicles to bring actives to the skin (anticellulite, antiwrinkle, slimming, firming, and so on..). SlimCell-Tex opens then us to a new era for active ingredients vehiculation able to transform our wardrobe and fabrics into active cosmetics (Cosmetotextiles) 24 hours a day! What are the practical advantages in using SlimCell-Tex? The main advantage of using SlimCell-Tex is the possibility to easily take care of oneself every day, even when you do not have time, or you do not feel like or, more simply, you would have forgotten to do it. The added ulterior important benefit is also to complement the results obtained with diets, sports, professional beauty treatments amplifying, speeding and consolidating them without any additional effort. Why should I use SlimCell-Tex if I already use cosmetics or other treatments? First of all because the fight against cellulite has to be a relentlessly one! In which cases should I then use SlimCell-Tex? When you have little time to get professional treatments or to apply any cosmetic SlimCell-Tex is then your solution; when applied to clothing it works for you, allowing you to carry out all your daily activities with no added effort: working, shopping, housekeeping, driving, sports, rest, play, cooking, shopping ... and so on. What are the main fields of application of SlimCell-Tex? Any tissue that comes into contact with the skin and then: jeans, trousers, tights, underwear, normal clothing, sportswear and ... even bed sheets! How much SlimCell-Tex should I spray? SlimCell-Tex must be sprayed in an adequate quantity to create a thin layer on the fabric enough to ensure a uniform coverage. Can I repeat the application of SlimCell-Tex to increase its effectiveness? Yes, of course! More applications of SlimCell-Tex can double, triple (and so on ...) the amount of FAS (Functional Active Substance) that we adhere to the fabric and that can then be transferred to the skin. It will just be necessary to wait some little extra time to let SlimCell-Tex dry. How many applications can be done with a 175 ml bottle of SlimCell-Tex? A 175 ml bottle of SlimCell-Tex is about 30 applications (in terms of fabrics means around 15 square meters). Shall I apply SlimCell-Tex inside or outside of the fabric? SlimCell-Tex must always be applied inside or in any case in the part of fabric that is more frequently in contact with the skin. At what distance should be sprayed SlimCell-Tex? The ideal nebulization of SlimCell-Tex should be carried out at a distance of about 50 cm (centimeters) from the fabric at an angle of approximately 45 ° (degrees). How often should I repeat the application of SlimCell-Tex? Much depends on what we do with a particular garment. For frequent use should be repeated once a week. In terms of hours of use are about 80/100 hours (time when we consume about all actives). For sportswear, it is suggested to repeat the application of SlimCell-Tex before every workout. Can SlimCell-Tex be applied directly on the skin? It would be just as improper application of SlimCell-Tex. Being a Cosmetotessile, it has been designed to be applied on tissues and not directly on the skin. If I apply SlimCell-Tex directly on the skin might it hurt me? Absolutely No! SlimCell-Tex is completely safe and innocuous, it would be, as already mentioned, just an improper application. No, SlimCell-Tex uses a green tea Allergen Free delicate fragrance. Is SlimCell-Tex's spraying system ecologic? 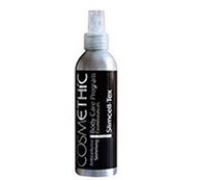 Yes, SlimCell-Tex spraying system, by Ethic choice, does not use propellants harmful to our atmosphere and even employs an natural atomizer. Does SlimCell-Tex contain harmful solvents? Absolutely No! SlimCell-Tex uses, as main solvent, natural demineralized water. Can I apply SlimCell-Tex on any kind of fabric? Yes, SlimCell-Tex is designed to be applied on any type of fabric: synthetic or natural, colored or neutral. Absolutely no! SlimCell-Tex does not stain or leave marks on fabrics. In case of doubt, it is anyway advisable to check the compatibility with the different textiles. How many washes can SlimCell-Tex withstand? SlimCell-Tex can withstand up to 3 normal washes. May the hot wash alter SlimCell-Tex? The characteristics of SlimCell-Tex determine its stability to the main fields of application. However, after the third wash, is always good to reapply the product. Do I have to wash fabrics with special detergents? No, absolutely not. SlimCell-Tex does not interfere with your daily habits.